I am thrilled to bring you a variety of wrap creations of my own design, using the Paleo Wrap by Julian Bakery! Paleo Wraps are made from 3 simple, Remedy Recipes Approved ingredients, such as coconut meat, coconut oil, & coconut water. The wrap is mild in flavor, and holds together very well. Julian Bakery’s Paleo Wraps are also available in a Turmeric Wrap. Women: 1 Paleo Wrap, Pre-made omelet containing: 1 whole egg, 1 additional egg white, 1/4 cup chopped spinach, 1/4 cup chopped mushroom, 1 slice Swiss, (or Provolone, or Cheddar,) 1/2 cup diced tomato. Instructions: Pre-heat the omelet & place it on the flat wrap, top with the diced tomato, & roll the wrap. Men: 2 Paleo Wraps, Pre-made omelet containing: 2 whole eggs, 2 additional egg whites, 1/2 cup chopped spinach, 1/2 cup chopped mushroom, 2 slices Swiss, (or Provolone, or Cheddar,) 1 cup diced tomato. Instructions: Pre-heat the omelet, cut it in half, & place it on the 2 flat wraps, top them both with diced tomato, & roll the wrap. Women: 1 Paleo Wrap, 3 oz. Pre-made Lemon-Pepper Grilled Chicken, (ready-to-go at Uncle Giuseppe’s! ), 1/2 cup baby leaf arugula, 1/4 cup roasted red pepper, 1 oz. shaved Parmesan. Instructions: Grilled chicken may be pre-heated, or served chilled, adding the other ingredients, & then roll the wrap. Add 6 Lundberg Sea Salt Brown Rice Chips on the side. Men: 2 Paleo Wraps, 6 oz. Pre-made Lemon-Pepper Grilled Chicken, (ready-to-go at Uncle Giuseppe’s! ), 1/2 cup baby leaf arugula, 1/4 cup roasted red pepper, 2 oz. shaved Parmesan. Instructions: Grilled chicken may be pre-heated, or served chilled, dividing & adding the other ingredients equally between the 2 wraps, & then roll the wraps. Add 12 Lundberg Sea Salt Brown Rice Chips on the side. MEAL 2 REMEDY WRAP: SAUSICH! Women: 1 Paleo Wrap, 3 oz. Grilled Balsamic Chicken (ready-to-go at Uncle Giuseppe’s! ), 1/2 cup baby leaf spinach, 1/4 cup roasted red pepper. 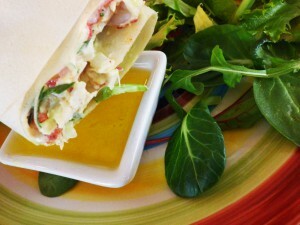 Instructions: Grilled chicken may be pre-heated, or served chilled, adding the other ingredients, & then roll the wrap. Add 17 Terra Sweet Potato Chips on the side. Men: 2 Paleo Wraps, 6 oz. Grilled Balsamic Chicken (ready-to-go at Uncle Giuseppe’s! ), 1 cup baby leaf spinach, 1/2 cup roasted red pepper. Instructions: Grilled chicken may be pre-heated, or served chilled, equally dividing & adding the other ingredients, & then roll the wraps. Add 28 Terra Sweet Potato Chips on the side. Women: 1 Paleo Wrap, 3 oz. of Remedy Recipes Lone Star Chili, (recipe on page 138 of my best selling book, Remedy Recipes!) 1 oz. shredded Cheddar. Instructions: Pre-heat the chili topped with the shredded cheddar, place on the wrap, & then roll the wrap. You may have a side salad along with this wrap. Men: 2 Paleo Wraps, 6 oz. of Remedy Recipes Lone Star Chili, (recipe on page 138 of my best selling book, Remedy Recipes!) 2 oz. shredded Cheddar. Instructions: Pre-heat the chili topped with the shredded cheddar, place equally on the wraps, & then roll the wraps. You may have a side salad along with this wrap. The Paleo Wrap by Julian Bakery is a real game-changer! For years, I missed the satisfaction of having a sandwich or a wrap. 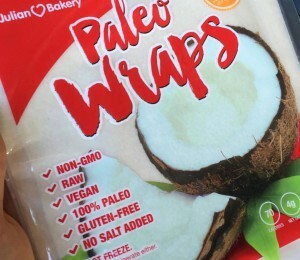 Now, with the Paleo Wrap I can finally bite into & enjoy all the flavors of the ingredients of the wrap at once! There is a difference between eating ingredients in a salad form, and tasting them all in one bite. I also enjoy creating different wraps for you. Before entering the Fitness Industry, I was a Deli-Man! I worked in a deli for 4 years, & created some pretty great sandwiches! In fact, people would come from far distances for my famous delicacies! So this is the next best thing for me. I kept them as simple & convenient as possible without subtracting from the deliciousness of each wrap! I truly hope that you enjoy these creations, and that you now have a delicious & convenient meal to take anywhere!